Add a touch of floral flair to your cards, scrapbook pages, and crafts with Inkadinkado's Mod Flower Flourish clear stamp set. Use these pretty stamps with one of Inkadinkado's clear acrylic mounting blocks, sold separately. Sheet size: 4" x 8", set of 4 stamps. Clear stamps featuring a great assortment of trees. Use them together or separately on cards, scrapbook page layouts, artist trading cards, gift tags and so much more! Halloween themed clear stamps featuring bats, an owl, a spooky tree, and more. This fabulous clear stamp sets is perfect for all of your stamping needs: scrapbooks, greeting cards, paper crafts and more! 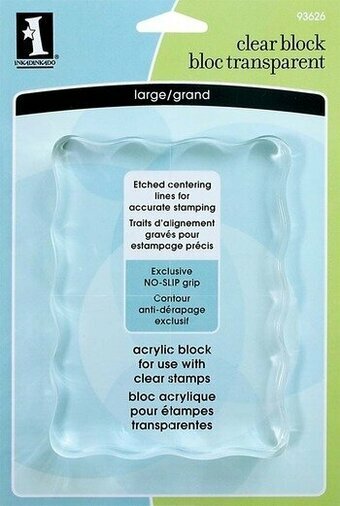 These non-yellowing stamps adhere to any acrylic block and allow you to see their exact positioning. Our Large Block is perfect for cling and clear stamps to create backgrounds and use multiple images at once, and big enough for our large 6" x 6" cling stamps. Grid lines assist with precise placement of stamps and the recessed design allows for easy use. Actual block size 6.5" x 6.5". Blocks have etched centering lines for accurate placement of your images, a wavy edge for a no-slip grip, and are crystal clear. The stamps cling like magic. This large Block lets you combine several stamps at once! Size 5" x 3.5"